* El acceso anticipado de 24 horas es exclusivo de la Digital Deluxe Edition y la Gold Edition. Personaliza tu nuevo gancho con nuevas capacidades mejoradas que te permiten crear tus propias acrobacias, estrategias de destrucción y estilo de juego. Experimenta con una enorme variedad de nuevos vehículos, que incluyen cazas militares, helicópteros, deportivos con turbo y vehículos para la construcción. Some people rely on spa days, firming moisturisers and botox in order to stay young. For Rico Rodriguez, star of the increasingly unhinged Just Cause series, a life of constant peril, skydives, explosions and overthrowing dictatorships seems to be doing the trick: over a decade after his debut, our hero’s barely aged a day. 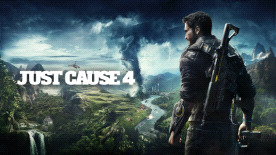 In Just Cause 4 the fundamentals of chaos-causing have been expanded exponentially, an all-new engine allowing greater physics modelling while an enormous new world map brings distinct regions and weather phenomena to Solis. Snowcapped mountains are where Rico can practice his snowmobile skills and wingsuit off enormous peaks, while the rainforest presents a different kind of vertical challenge: thick desert canopy to navigate by going over or through it. Thunderstorms in this region are particularly severe, with lightning forks surging down onto the highest points. Then there’s the grassland, which would be relatively serene if it wasn’t for the presence of tornadoes. Meanwhile over in the desert, there’s plenty of plains for you to master the various air vehicles above. Or, indeed, create your own. The grappling hook has become a kind of developer toolset in Just Cause 4, empowering the player with addons to elevate and launch any object. Fancy making an impromptu zeppelin out of a shipping container? Just fire some balloons onto its corners, hop on and jet-propel yourself through the air. Hope you packed a parachute before taking off - although what are we talking about? Rico always packs a parachute.